On Tuesday April 30, UCC conducted an exclusive interview with a newly appointed Senator, the Honourable Denise Batters, to discuss her new role and responsibilities in the Senate, current initiatives and the Senator’s Ukrainian background. In an intimate setting, Senator Batters answered questions covering her educational background, her interest in politics and her fondest memories regarding her Ukrainian – Canadian heritage. Senator Batters smiled warmly, recalling how even at the tender age of 12, she knew she wanted to be in the Senate. Coincidentally, her husband Dave had also known he had a calling in Parliament at an early age. “They used to have a show on television called This Week in Parliament, which was right before Hockey Night in Canada and I used to watch it every week. When my husband was little he wanted to be an MP or an MLA and I wanted to be a Senator, I’m not sure why that initially started but I was drawn to the whole idea of sober second thought,” stated Senator Batters. Senator Batters grew up in Regina, Saskatchewan and was very involved with the Ukrainian community throughout her childhood. The Senator attended Ukrainian School as well as participating in the Ukrainian Folk Dance Ensemble TAVRIA with whom she danced at the Canadian Pavilion during EXPO ’86 in Vancouver, British Columbia. The Senator was baptized and still attends St. Basil’s Ukrainian Catholic Church in Regina. Senator Batters shared warm memories of her youth, which included competing and winning the title of ‘Miss Kiev’ – representing the provincial Ukrainian community at the multicultural festival MOSAIC in Regina in 1989. A politically engaged individual from the start, Senator Batters also shared fond memories of her political endeavours with her husband, the late Dave Batters, a Member of Parliament from 2004 to 2008. Senator Batters openly discussed Dave’s political roles, commenting on the stresses of a political life and how her political ideology has been shaped because of it. Dave Batters had left his MP position due to severe anxiety and depression, and sadly died by suicide in 2009. During the course of the interview, the Senator reflected on the generosity of spirit of her late husband and reaffirmed her commitment to his cause by politically and personally ensuring that dispelling the stigma of mental illness would remain an independent as well a political priority. Senator Batters openly encourages Canadians to watch a 30-second television commercial produced by the Senator herself in memory of Dave, focusing on raising awareness about depression and suicide at a local, community and provincial level. To view the commercial please click on the video link below. Senator Batters graciously commented on how being a part of the Senate provides a national platform to discuss these issues in addition to working alongside other influential colleagues and spokespeople, including Ukrainian Senators Raynell Andreychuk and David Tkachuk. 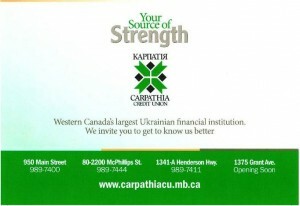 Senator Batters proudly pointed out that 50% of the Senators from Saskatchewan are 100% Ukrainian. The UCC has launched a national campaign urging Canadians to voice their concerns over the content and layout proposed for the Canadian Museum for Human Rights. On a recent tour of the museum members of the UCC found Ukrainian Canadian themes inadequately represented. Paul Grod has stated ” We are deeply troubled that neither Canada’s first national internment operations nor the Holodomor will have permanent and prominent exhibits and galleries in the Museum”. 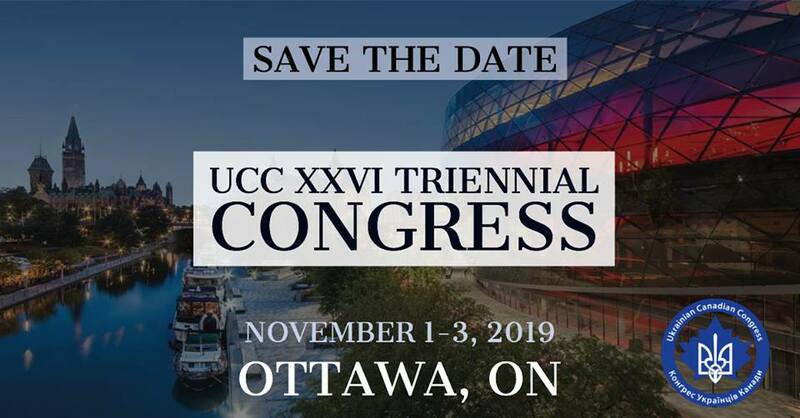 The UCC has released a video of the presentation made by President Paul Grod outlining its concerns relating to the content of the CMHR. To view the video, please click on the link below. 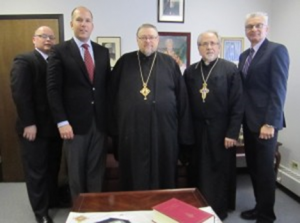 Left to Right: Taras Zalusky, Paul Grod, Metropolitan Yurij Kalistchuk, Rev. Victor Lakusta, Walter Dlugosh. The UCC has launched a cross-country “Roadshow” to inform various communities about current initiative. UCC President Paul Grod has been meeting with local branches and held community outreach meeting while meeting with community leaders. 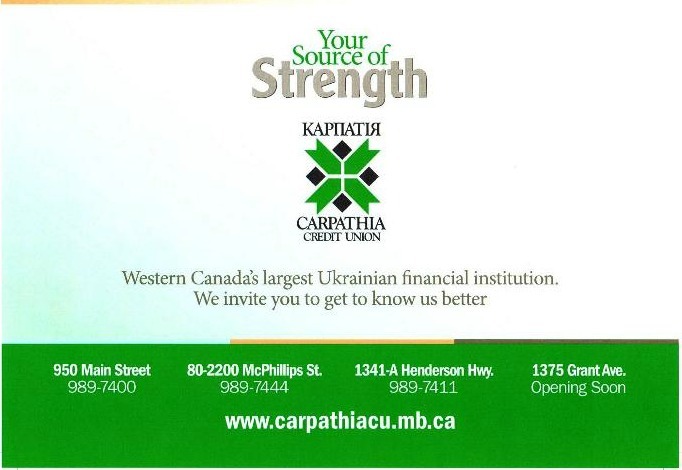 In early April, a UCC delegation including President Paul Grod, Manitoba UCC President OKsana Bondarchuk met with community leaders in Brandon, Manitoba on Friday April 5, at the Ukrainian reading hall and discussed challenges and opportunities for cooperation in Brandon. On April 6, a founding meeting of the UCC Dauphin & Parklands Branch was held. The meeting adopted a constitutions and by laws for the branch and selected a president and executive. The executive of the branch is as follows: the Honorable Len Derkach as President, Mr. Paul Trochanowski as Vice -President, Ms. Shirley Nowalkowski as Secretary and Ms. Jennifer Chatyrbok as Tresurer. Please click here to read more about the Manitoba Roadshow. UCC President Paul Grod and Executive Director Taras Zalusky traveled to Alberta April 19-21 visiting the Calgary, Edmonton and Red Deer communities. 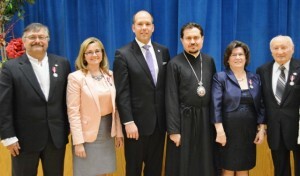 From Left to Right: UCC – APC President Barbara Hlus, Mike Hantzsch,Paul Grod, Halyna Lyp’ska and Ukrainian Catholic Bishop David Motiuk. 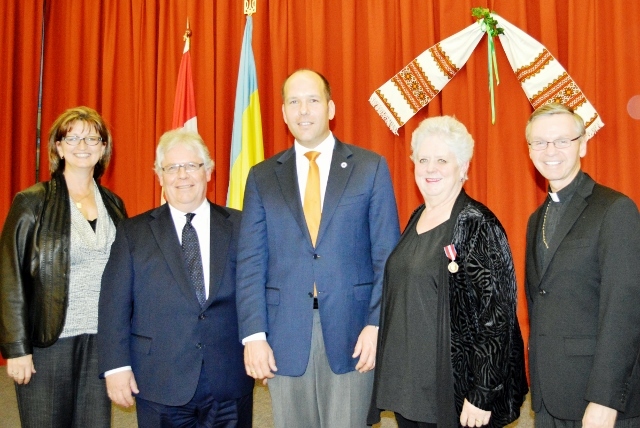 On Friday April 19, Mike Hantzsch and Halyna Lyps’ka Wilson were honoured for their many years of dedication and service to the Ukrainian community by receiving the Queen Elizabeth II Diamond Jubilee Medals presented to Grod. Left to Right: Andrij Hladyshevsky, Daria Luciw, Paul Grod, His Grace the Rt. Rv. Bishop Ilarion Rudnyk, Marian Gauk and Peter Dackiw. On Saturday April 20 in Edmonton, Petro Dackiw, Daria Luciw, Andrij Hladyshevsky and Marian Gauk were awarded the Queen Elizabeth II Diamond Jubilee Medals for their involvement in the community. Please click here to read more about the Alberta Roadshow. 8 -10. Community meetings were held with local branches, UCC Saskatchewan Provincial Council and community leaders in Regina and Saskatoon. The official opening of the Banff Internment Pavilion will take place at Cave and Basin in Banff National Park on June 20, 2013. The UCC Annual General Meeting (AGM) will be held in Vancouver, British Columbia onJune 22-23. A community meeting will be held on Saturday June 22 at St. Mary’s Ukrainian Catholic Center.